GET THE BEST DATES & RATES FOR THE 2019 SEASON RIGHT HERE! Langara Island is a mecca of salmon and halibut fishing, offering the best saltwater fishing found anywhere in British Columbia! 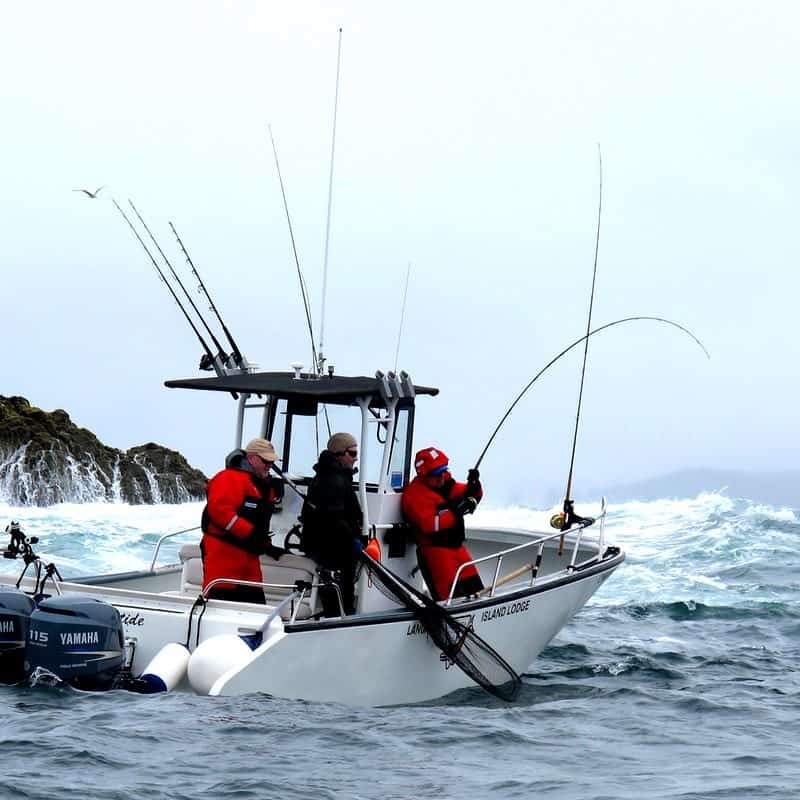 Our Langara Island fishing packages will put you into the heart of this remote area, fishing with top guides and enjoying the amenities of the world-class Langara Island Lodge. Packages are all-inclusive, including flights from Vancouver, unlimited guided fishing, deluxe accommodations, lodge amenities, meals, alcohol and fish packaging. Below is more info and you can also see our Langara Island Fishing FAQs page that will answer our most common questions about the trip. Why do people like planning their Langara Island fishing trip with me? I always get clients the most prime dates and make sure they’re fishing with our crew of top guides. Having spent the past 12 seasons guiding full seasons at Langara Island Lodge I’m here to give you insight into a trip you simply won’t find anywhere else! 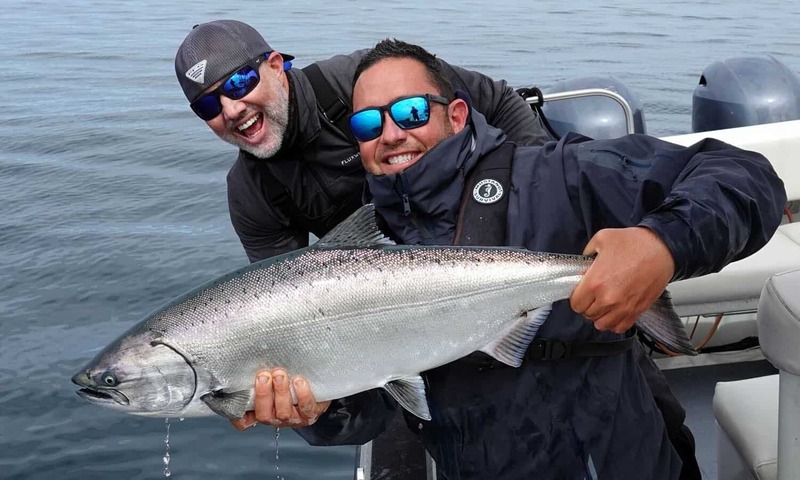 For our best 2019 fishing dates, detailed pricing and more info on our all-inclusive Langara Island fishing packages, send me a note today. Look forward to welcoming you to the best saltwater fishing program in BC this Summer. 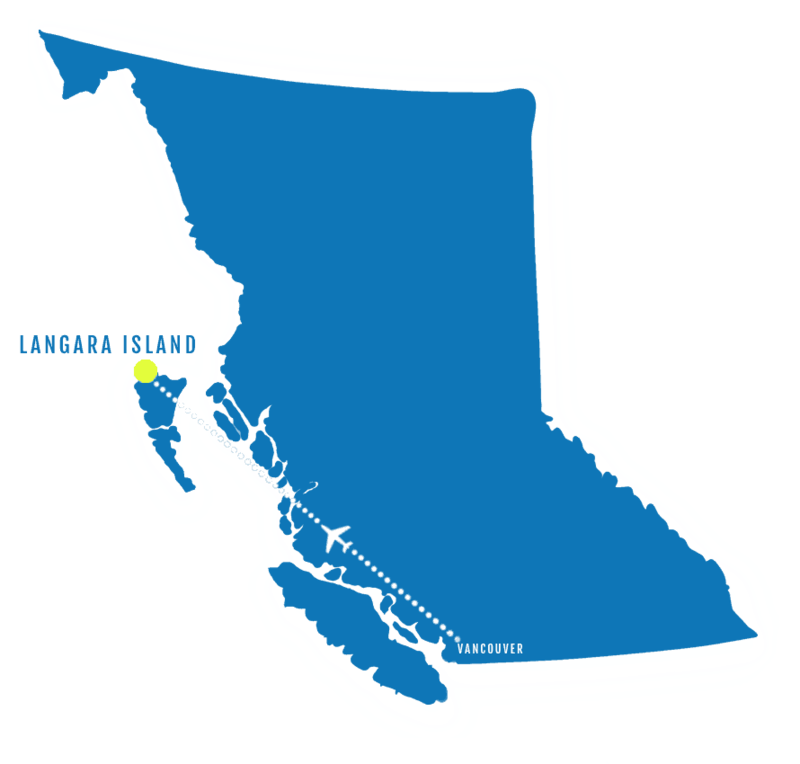 At Langara we offer four and five day all-inclusive packages that begin with a chartered flight from Vancouver to the small village of Masset on northern Haida Gwaii. From there you’ll board a lodge helicopter for the scenic trip into BC’s most remote saltwater salmon fishing lodge. 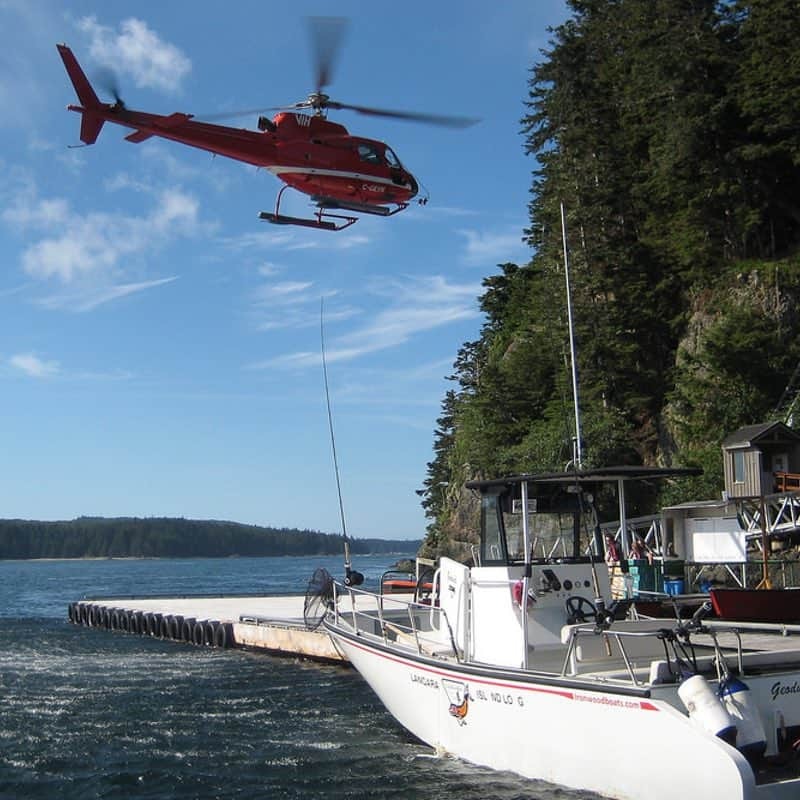 Helicopters land right on the dock and from here your Langara fishing adventure really begins. You’ll be greeted by lodge staff and will soon find yourself in the comforts of our five star lodge. All-inclusive means all-inclusive, no hidden costs, the Langara program cuts no corners and you’ll be treated to an epic saltwater fishing adventure during your stay. All the fishing is at our doorstep, within a 5-20 minute run from the lodge we have 40 jaw dropping areas to fish. No long boat runs like many other Haida Gwaii lodges that can be 45+ minutes before you’re actually fishing. Private boats are fully guided, all with bathrooms on board and run by the most experienced saltwater guide staff on the coast. 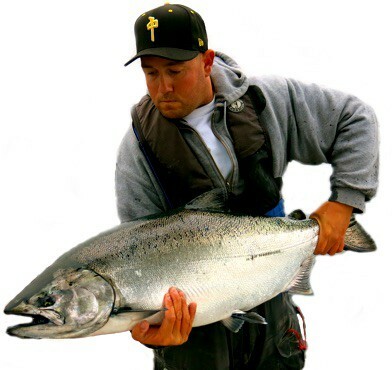 Whether it’s a family, couples, corporate or friends trip, if you’re looking for the ultimate saltwater salmon fishing experience in Canada, then Langara Island it is. SOUNDS PRETTY GOOD RIGHT? 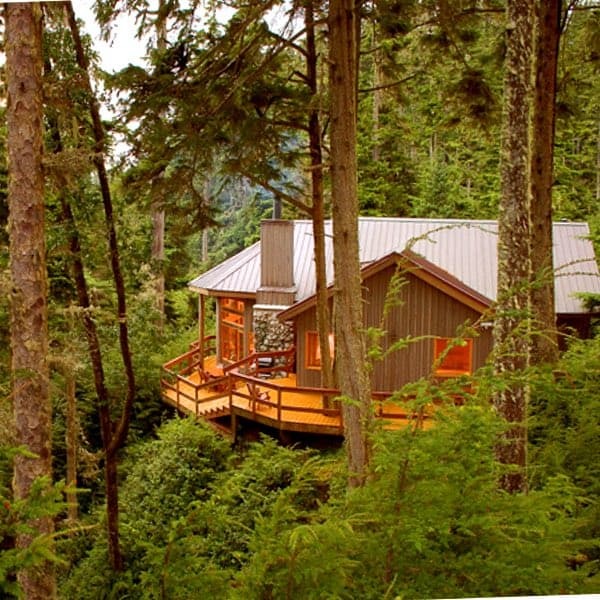 CONTACT US ABOUT LANGARA ISLAND DATES & PRICING HERE! The four day Langara Island package gives you four days and three nights at Langara Island Lodge. Pricing is in Canadian Dollars, and if you’re coming from the US you’ll enjoy an excellent exchange rate at this time. 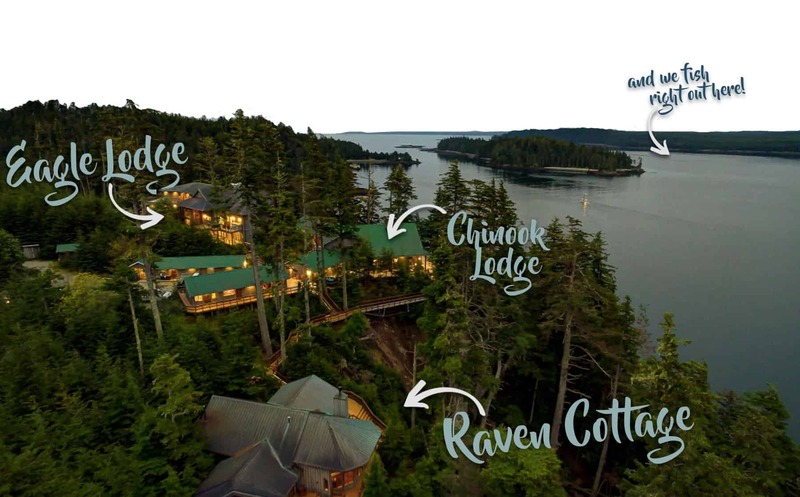 Packages are all-inclusive, with flights from Vancouver, helicopter transfers to the lodge, private guided salmon fishing, luxury lodge accommodations, dining, alcohol and fish packaging all included. Contact us for availability and a detailed quote. Based on double occupancy. Guide boat rates are per group, inquire for pricing. 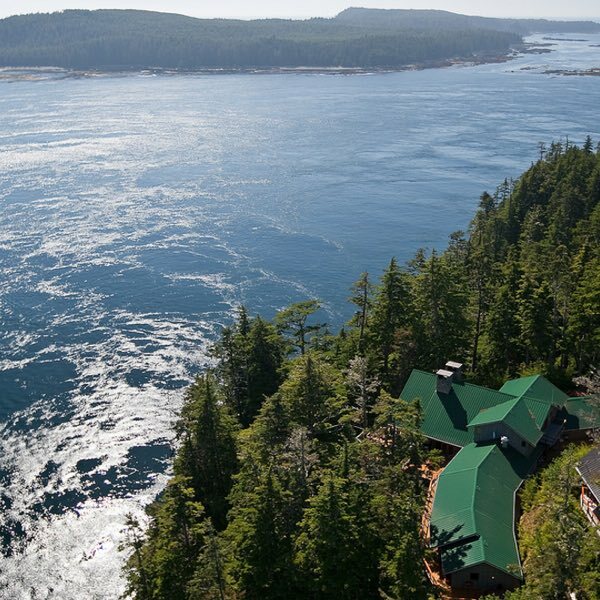 The five day Langara Island package gives you five days and four nights at Langara Island Lodge. 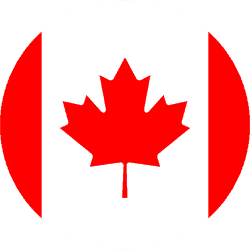 Pricing is in Canadian Dollars, and if you’re coming from the US you’ll enjoy an excellent exchange rate at this time. 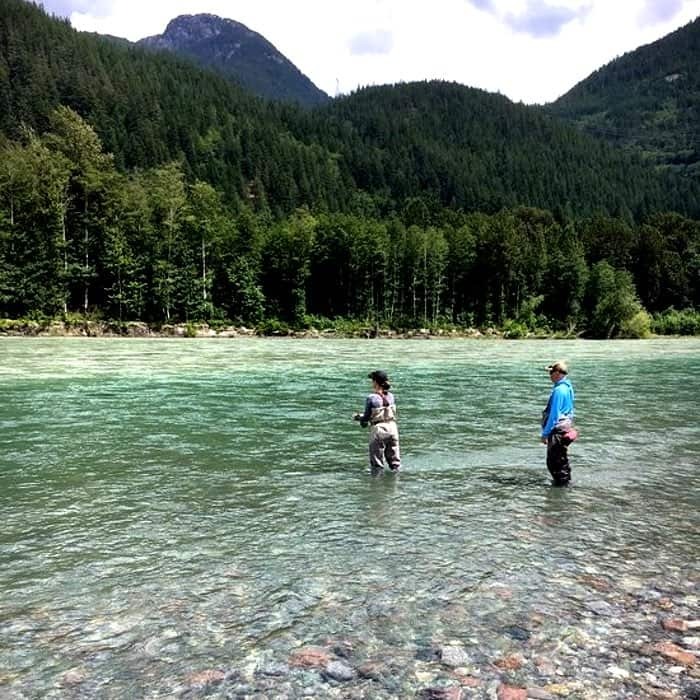 Packages are all-inclusive, with flights from Vancouver, helicopter transfers to the lodge, private guided salmon fishing, luxury lodge accommodations, dining, alcohol and fish packaging all included. Contact us for availability and a detailed quote. 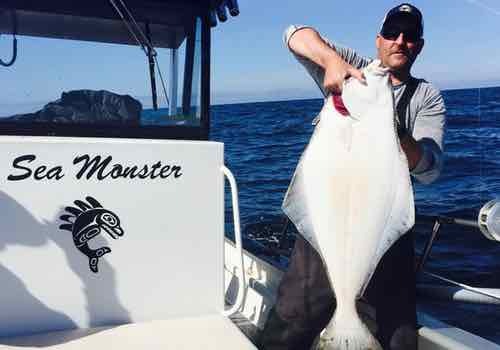 It’s no secret that Langara Island and the northern part of Haida Gwaii offers anglers the best salmon and halibut fishing found anywhere in British Columbia. This area is truly a fishing paradise, with inshore, offshore and bottom fishing all within 5-20 minutes from the lodge dock. Why is fishing at Langara Island so good? Well it has historically been the first major feeding station for salmon coming off the open Pacific Ocean, they’re here to do one thing and thats EAT! 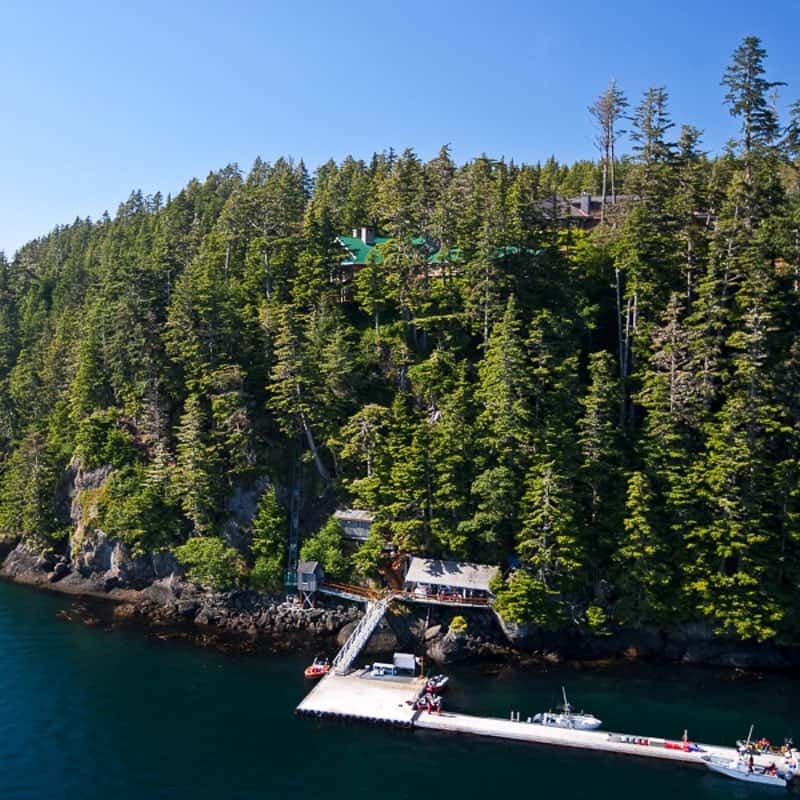 Langara Island Lodge is where Chromer Sport Fishing’s Tom Thomson and Yos Gladstone guide during the Summer months. 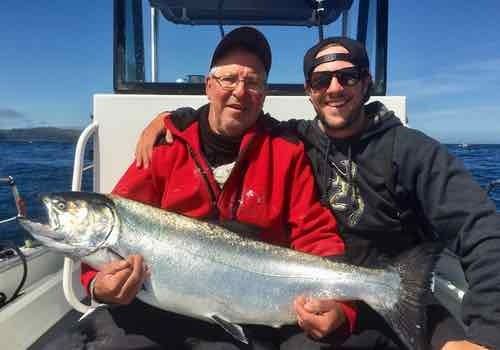 Both Yos and Tommy have guided at Langara Island Lodge for over a decade and can lend invaluable advice when planning your Langara Island fishing trip. Besides the incredible fishing and luxury lodge another benefit fishing at Langara Island compared to anywhere else in Haida Gwaii is the short run times we have to our fishing grounds, average time from the dock is 5-15 minutes. 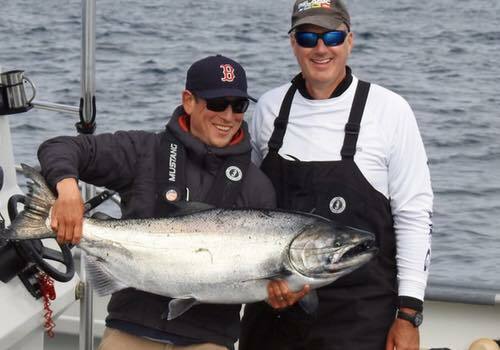 Almost every other salmon fishing lodge has a 45+ minute run before they’re ever fishing! This is a key advantage of our Langara Island fishing program. You’ll be fishing in total comfort. Langara operates a fleet of 17 fully equipped private boats, all with bathrooms on board, so you can be assured a comfortable experience for all members of your group. The Langara Island style of fishing is cutplug mooching, no heavy gear or down riggers. We fish light rods in shallow water for BIG fish. This is a style of fishing found few places anymore on the BC coast and a big part of why fishing is so fun at Langara Island. You’ll be fishing on your arrival day, in the afternoon, and on departure day, in the morning before you leave. The Langara Island guiding program is built with maximizing fishing time and with no set daily schedule you can fish as much or as little as you’d like each day. IT’S INCLUDED IN YOUR PACKAGE! 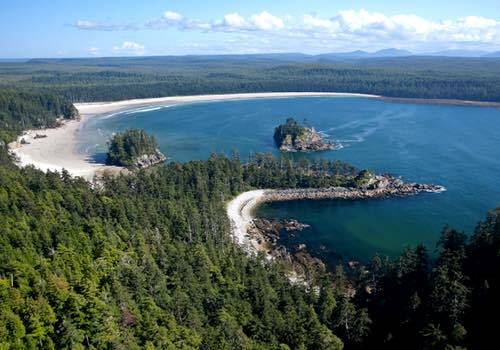 To begin your Langara Island adventure you’ll fly from Vancouver to Masset BC, a small coastal community located on the northern part of the Haida Gwaii Islands. Haida Gwaii translates to “Islands of the People” and is home to the Haida First Nations, one of the oldest known populations of human inhabitants in North America. Once you arrive in Masset helicopters will be waiting to fly you the 15 minute flight to the lodge. We suggest you stay in Vancouver the evening prior to your trip to Langara Island. The Fairmont Vancouver Airport Hotel offers the most convent location, with the shuttle service. On your return to Vancouver, you can plan on being back around 4:30 PM, enough time to catch an evening flight from YVR or you can opt to stay the night and travel home in the morning. 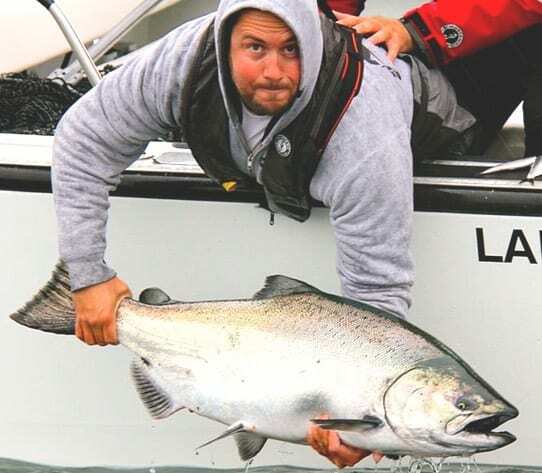 Perched on the protected southern shoreline of Langara, Langara Island Lodge is well respected as the premier salmon fishing lodge in British Columbia. 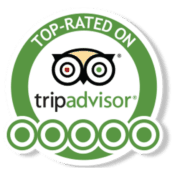 You’ll enjoy excellent accommodations, world-class dining and first class service while at Langara, the over 90% return rate is a testament to that. 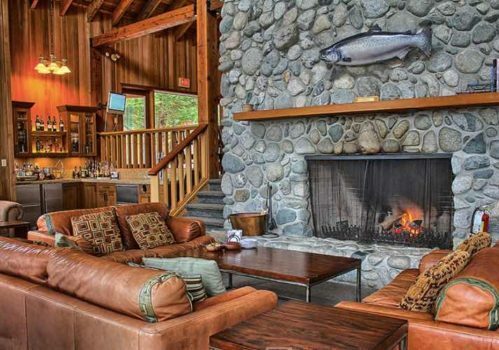 The main Chinook Lodge holds up to 22 guests, this is a stunning building built around a giant stone fireplace. 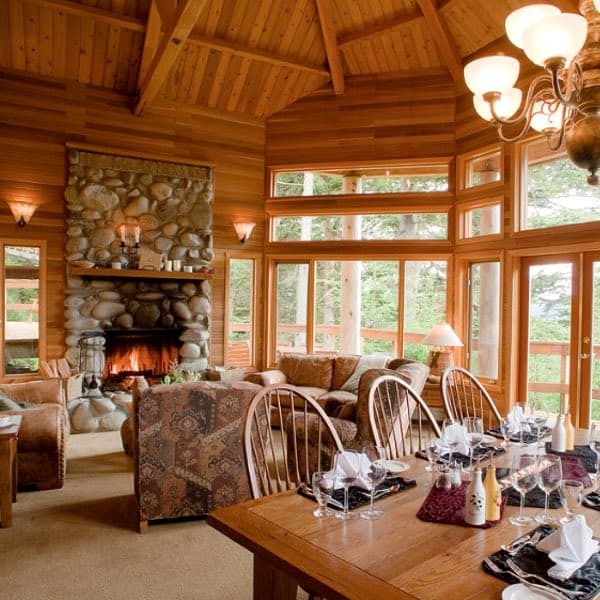 The Eagle Cottage is the most lavish branch of Langara Island Lodge, the perfect setting for families or exclusive groups of up to 12 guests. The Eagle Cottage is the newest of the lodges and has its own private kitchen, games room and viewing decks overlooking the water. The Raven Cottage is the most intimate facility at Langara Island Lodgeo, offering the ultimate in privacy for groups of six. 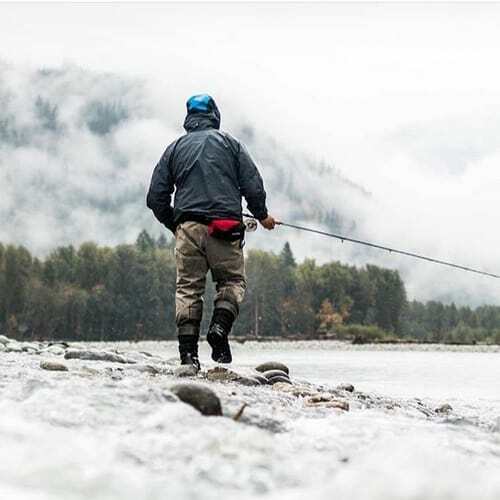 There are no hidden costs, your package is all-inclusive so you can enjoy up to 13 hours a day of guided fishing, all meals & alcohol, lodge accommodations, amenities, flights, helicopter transfers and impeccable service in one simple package price. 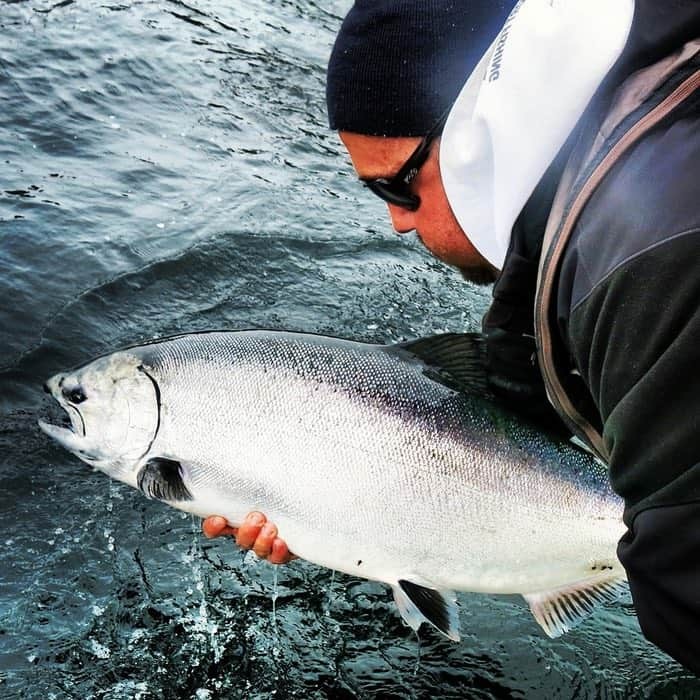 For more info on a Langara Island fishing trip please Yos Gladstone via direct email or call toll-free 1-877-902-3393. 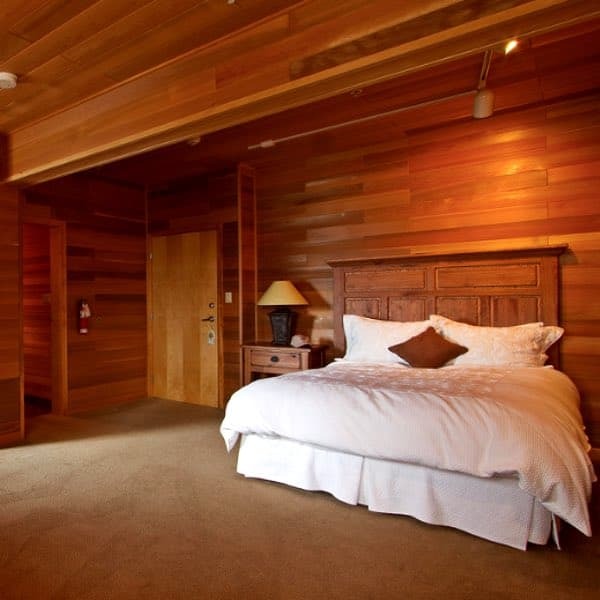 The Chinook Lodge has 22 guests in eleven spacious rooms. 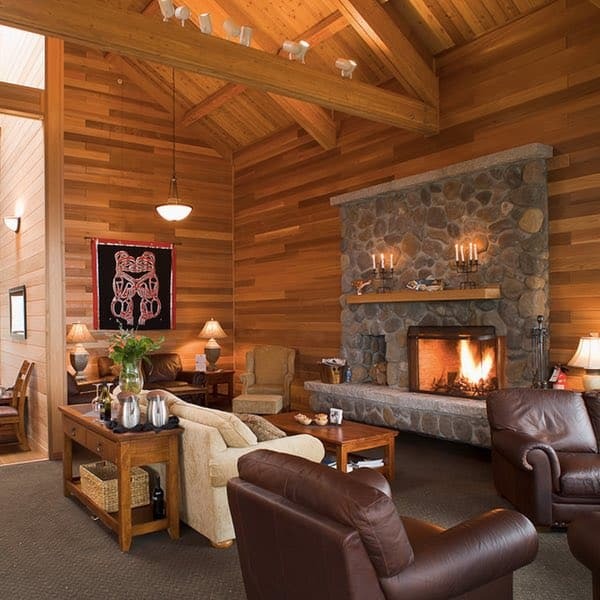 The lodge’s wide open layout and spacious lounge offers the ultimate in comfort. A group dining area plays host to the evening meals. The Chinook Lodge has a games room with pool table, darts and big screen tv. There is also two large hot tubs, spa and steam room. The Chinook lodge is perfect for any size group and offers Langara Island guests the quintessential BC salmon fishing lodge experience. Sitting high above the ocean below is the 12 person Eagle Lodge. With large sundecks overlooking all directions of the island, including amazing water views, the Eagle Lodge is perfect for larger family groups or smaller corporate groups. On occasion there are mixed groups in the Eagle, these weeks are suited for couples or small groups. 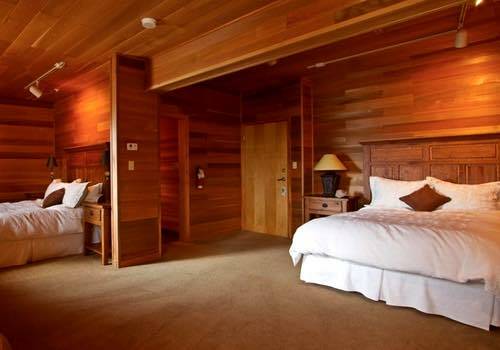 The Eagle Lodge has a large games room, private kitchen, secluded hot tub and spacious bedrooms. The lounge and dining are overlook the water. 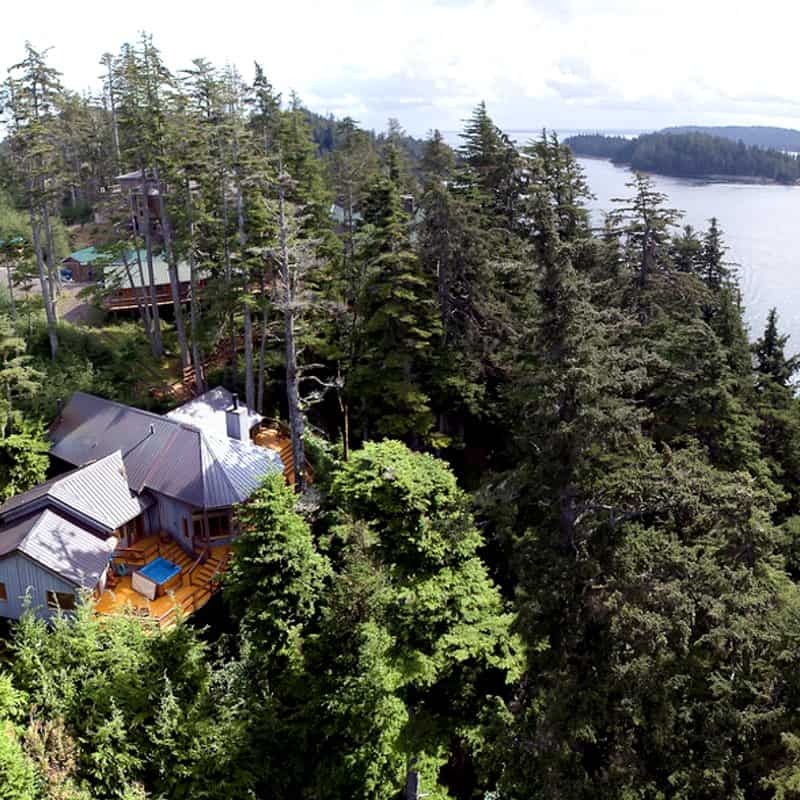 If you’re looking for the ultimate in privacy, service and luxury, then the six person Raven Cottage at Langara Island will fit your bill. This three bedroom cottage has a capacity of 6 people and overlooks Parry Passage, orcas can be seen right from its decks. Perfect for smaller groups of family or friends the Raven Cottage has a private dining and lounge area, a perfect retreat, like your own personal cabin in fishing paradise. GOT YOUR PICK YET? CONTACT US FOR THE BEST DATES AT EACH LODGE! 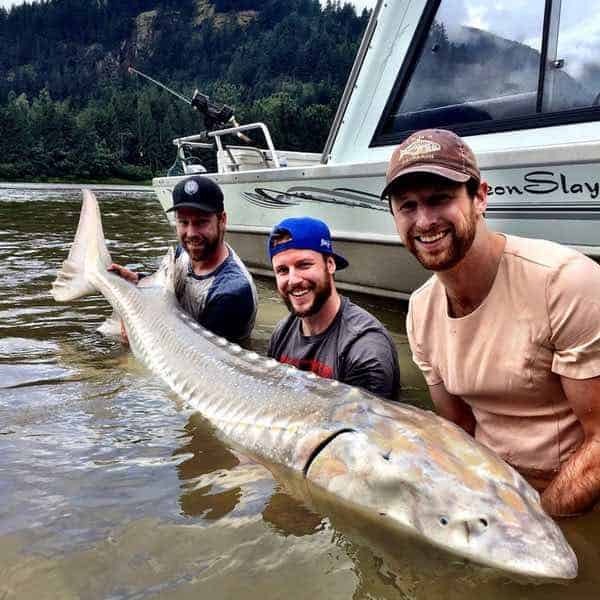 Add on a day or two of sturgeon fishing to your Langara trip, we make it easy. We’re guiding 365 days a year from Vancouver and Whistler BC. Getting started planning a Langara Island trip with us is easy, simply fill out our online contact form or shoot us an email or call our office toll-free 1-877-902-3393. We’ll get back to you right away with seasonal availability and specific pricing. We look forward to earning your business, thank you.